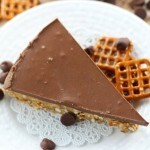 Is this Chocolate Peanut Butter Coffee Cake dessert or breakfast? You decide. Maybe BOTH! 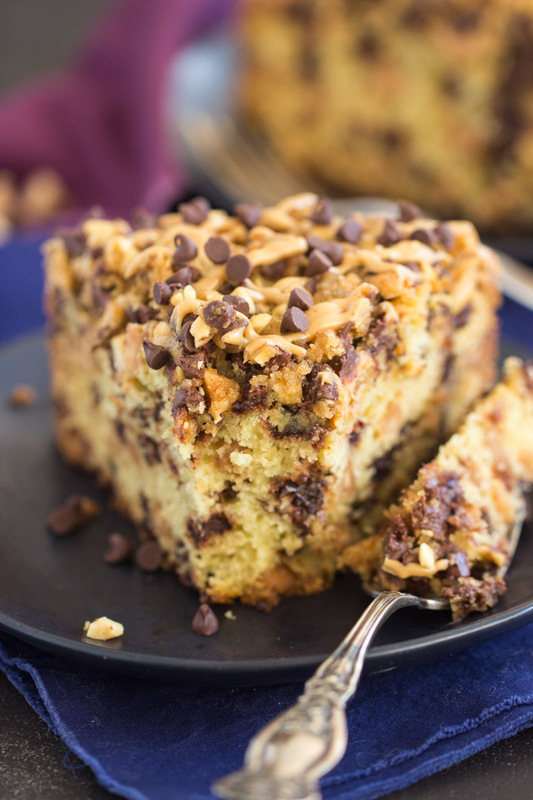 This buttery, moist, tender coffee cake is mile-high, and chock-full of chocolate and peanut butter. 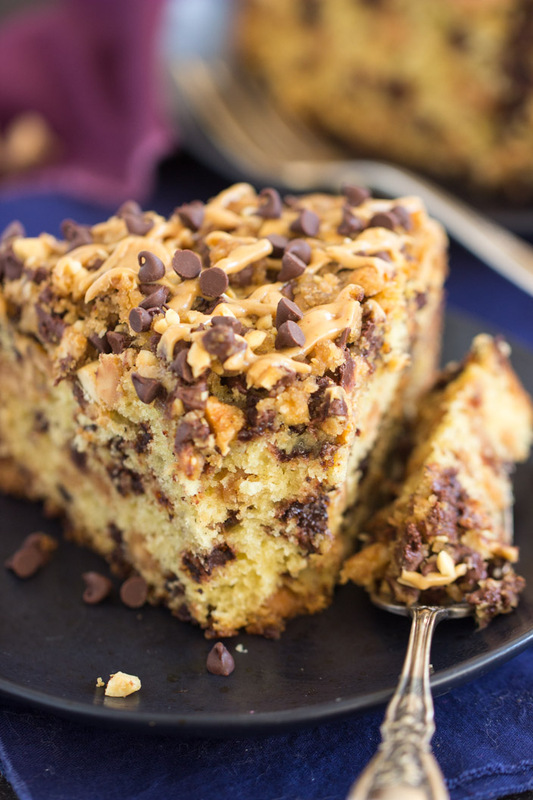 This Chocolate Peanut Butter Coffee Cake is a must for your next brunch! The idea for this Chocolate Peanut Butter Coffee Cake was planted a long time ago, but it took a while to execute. For the longest time, I wasn’t sure how I wanted to go about this. 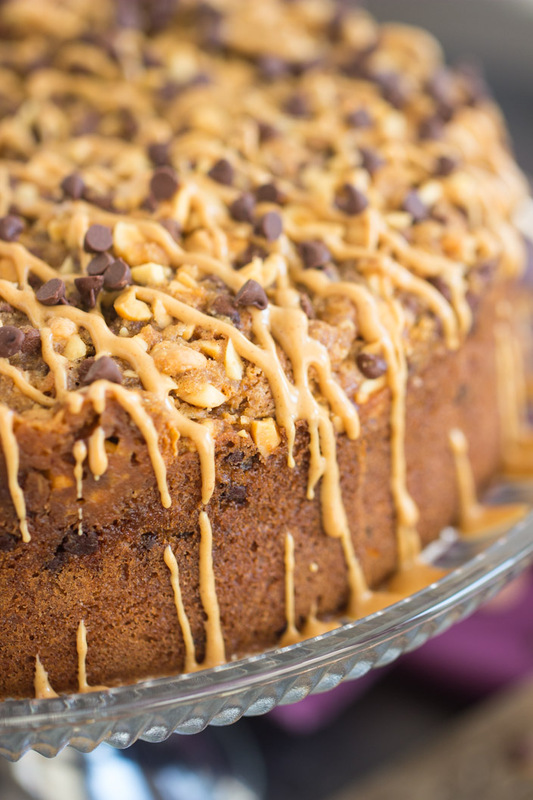 I couldn’t decide what recipe to adapt into this Chocolate Peanut Butter Coffee Cake. 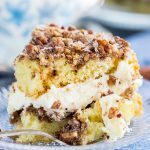 Ultimately, I decided to start with this Toll House Crumb Cake recipe from an old recipe book. I’d dog-eared this recipe years ago! I’ve wanted to try it for ages, and it had good bones for adding peanut butter to it. In the interest of full disclosure though, this Chocolate Peanut Butter Coffee Cake doesn’t actually have any peanut butter in it. Haha. But don’t write this off because it’s still fully loaded with peanut butter flavor. It’s totally jammed with peanut butter chips, and it’s got a hefty drizzle of peanut butter on top too. How do you feel about peanut butter chips? I actually like them quite a lot, but my family is not into them at all. I kind of understand, but I personally really like them. 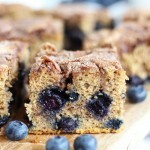 Regardless, even if they’re not your favorite baking chip, once you try them in this coffee cake, I think you’ll sing a different tune. They’re so wonderfully rich and melty, and they taste so much like melty globs of actual peanut butter. 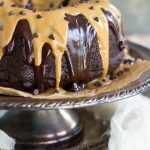 Nevertheless, to make sure I have real peanut butter in this recipe, I gave this Chocolate Peanut Butter Coffee Cake a generous drizzle of melted peanut butter for garnish. I have big plans for adding peanut butter straight into the batter of a coffee cake recipe, but until I decide how I want to do that, we’ve got this Chocolate Peanut Butter Coffee Cake recipe to tide us over. It’s a splendid balance of both chocolate and peanut butter in a buttery, moist, delightful coffee cake. 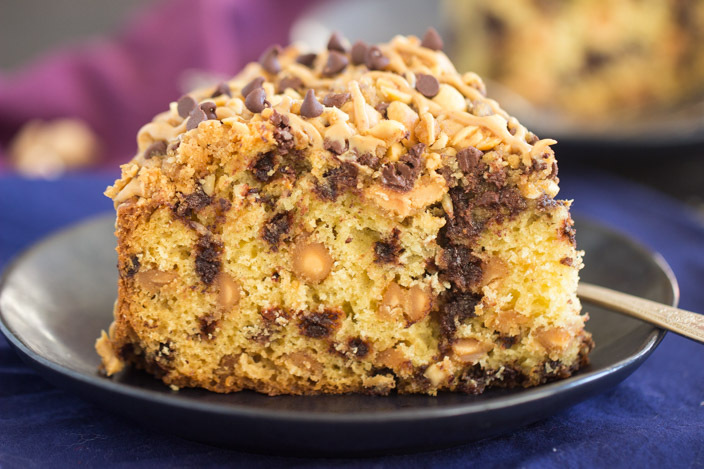 It’s just loaded with chocolate chips and peanut butter chips. Each bite is chock-full of morsels. 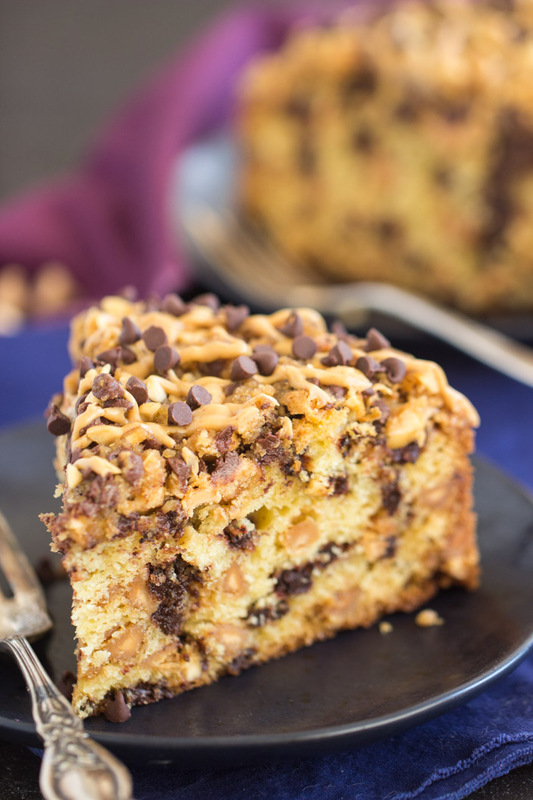 Bonus: this Chocolate Peanut Butter Coffee Cake has got a serious crumb topping!! If you want to explore other breakfast recipes that include peanut butter, you must try this Reese’s Peanut Butter Cup Monkey Bread, these Chunky Monkey Cookies, or these Peanut Butter Bacon Breakfast Cookies! My big idea for adding real peanut butter to this recipe would be to add a peanut butter and cream cheese filling in the middle. I think if you don’t put out a recipe that way I will myself it sounds so good to me. Great recipe as is thanks. Oh gosh, that’s a BRILLIANT idea. Next time, I’ll do that for sure! If there is a better combination than chocolate and peanut butter then I’ve never tasted it. They just go together perfectly. This cake came out awesome too. Thanks! You made it? You liked it? Aaaaah! I’m so glad to hear that. 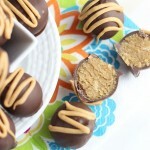 Yes, I do love chocolate and peanut butter, it’s a hard pair to beat. But I must say, I think I personally like white chocolate with peanut butter even better. Eek – I said it. 🙂 Have a great weekend, Geneva! Looking delicious! I want to try them. Thanks for sharing!